Using recognizable pictures of other people on your website, blog or publication of any kind requires their express permission (unless they are a celebrity or it is ‘newsworthy’ photo). How do you do this? Ask them for permission AND have them sign a simple agreement giving you permission to use their image. Specify in the agreement the ways, websites, publications etc where the photo will be used. Cover your bases and get permission to use the photos you take of other people at the time you take the picture. (These types of agreements are called a Photo Release or Model Release). See –> http://wp.me/p10nNq-J for more information on Photo releases and www.kasterlegal.com. If you have reached this posting because you Googled, “is it free to use photographs taken from another person’s website” ….the answer is probably NO… and this post is dedicated to you. Just because it is EASY to access and copy photographs via the internet doesn’t mean that the photographs are free for the taking. Copying a photograph from another website or online article or blog can easily violate another person’s copyright in the image. Did you know that every original work (including photographs, designs, poetry, text, music… etc) that is created in the US today, is instantly vested with copyright as soon as it is written down, printed… or ‘fixed in any tangible form’? It’s true. Copyright is instantly vested in fixed, original works and this means that the owner has the right to monetize the work. (ie charge a fee to license or sell a photograph). As you might guess, the price to license a photograph depends on how you plan to use the image and for how long. For example to license a photograph from Getty Images for 1 month, to use on a social media site costs approximately $160… and $360 for 3 months. (the price varies by image etc). Or hire a photographer to take photographs for you! Or take them yourself. For more information see: State Laws: http://www.ncsl.org/default.aspx?tabid=13463; Children’s Online Privacy: http://business.ftc.gov/privacy-and-security/children%E2%80%99s-online-privacy; EU ‘safe harbor’ arrangement: http://www.ita.doc.gov/td/ecom/menu.html; @iplegalfreebies and www.kasterlegal.com. Do you remember the hoopla that surfaced in 2006 when Jamie Thomas was sued by Capitol Records for illegally downloading 24 songs for her personal use? Were you wondering what happened to her? ANSWER: she’s been in and out of court this whole time… and last week a District Court Judge drastically reduced the damages awarded to the record company on a constitutional basis. The Story: Ms. Jamie Thomas illegally downloaded 24 songs on Kazaa (for her personal use) and was sued by Capitol Records. After Capitol Records sued Ms. Jamie Thomas for illegally downloading 24 songs that they own…. a copyright controversy swelled when the jury awarded damages of $222,000 ($9,250 per song) for Jamie’s infringement. The media continued to follow the case as it moved in and out of court and the damages awarded to Capitol Records for Jamie’s copyright violation shifted upward from $222,000 ($9,250 per song) to 1,920,000 ($80,000 per song) and back down to $1,500,000 ($62,500 per song). What happens now? This decision could be appealed again by either side. When does copyright protection start? It starts automatically, as soon as you create an original work. It’s like having a baby (ie your creative, brain child)… as soon as it’s in this world it’s yours and it’s covered by copyright protection. You don’t have to DO anything… other than create it and put it in a fixed and tangible form. What does this mean? As soon as you have written a song down; typed out a manuscript; applied pen or paint to paper… copyright protection starts automatically. 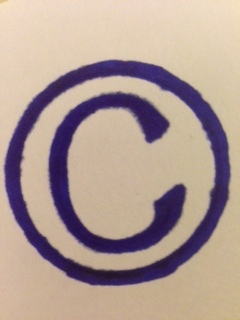 Using the copyright symbol © and registering your copyright with the US Copyright Office are two extra steps that give you more rights in your copyrighted work if and when you want to sell it, transfer it or protect it from being abused, misused or copied by other folks. There is 99.999% chance that you have created original works that are already covered by copyright protection… even if you didn’t know it. When quotes from copyright protected works can be used in other books, blogs or websites without permission of the copyright owner… is a popular topic… lets explore it further. As I’ve mentioned before that this is a gray area. Unfortunately, there are no set rules about how much or what percentage of a copyrighted work can be used for free (ie without permission of the copyright owner); however, here is a tip to keep in mind. The HEART of a work is heavily protected by copyright law. What does this mean? This could be a famous and popular refrain that embodies the HEART of a famous speech; This could be 300 words out of an unpublished memoir that reveals the key (or HEART) of the story; This could be an original and unique part of a song or lyrics (ie the HEART of the work). Courts use a sophisticated, multi-part test to evaluate when a portion of a copyrighted work can be used without permission. For the rest of us… using common sense is a good place to start. If you are copying the HEART of someone else’s work to use in your blog, book or website… permission is probably needed. For more info on this topic see these other two posts: http://t.co/2rhWznM and http://wp.me/p10nNq-fd AND for more info on PUBLIC DOMAIN works that are FREE to use and quote from —> http://wp.me/p10nNq-ft and http://wp.me/p10nNq-gn); @iplegalfreebies and www.kasterlegal.com.